Dr. Lottes was born October 15, 1906, in Cape Girardeau, Missouri. He died Thursday, February 7, 2002 at the age of 95. He was the son of Andreas and Birdie (Dockins) Lottes. Dr. Lottes was an orthopedic surgeon and an alumnus of the University of Missouri. Dr. Lottes is most famous for inventing the Lottes Nail, the first triflange nail for correcting fractured tibia. He served for eight years in the medical corps during World War II. He was the past president of the St. Louis Medical Society. 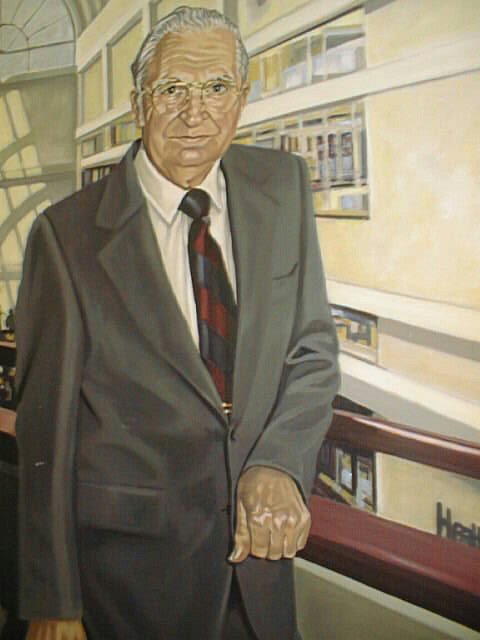 Dr Lottes demonstrated his dedication to UMC with a 1979 land gift, valued at 1 million to help finance the Health Sciences Library at the University of Missouri, Columbia, which was named in his honor. The MU School of Medicine honored the late J. Otto Lottes, M.D. with a ceremonial tree-planting May 4, 2002. J. Otto Lottes II and his younger brother, Morgan, planted the tree outside of the MU Health Sciences Library, which bears the name of their late grandfather. Leaders of the Missouri State Medical Association, St. Louis Metropolitan Medical Society and the University of Missouri joined Lottes’ family and friends at the ceremony. Memorial gifts in honor of Dr. Lottes are being accepted by the Medical School Foundation. Write to J. Otto Lottes Library Endowment, Medical School Foundation, One Hospital Drive, DC 205.00, Columbia, MO 65212. If you want to talk to someone about the endowment, please contact Sue Dunkin at dunkins@health.missouri.edu or by phone at 882-5371 or call toll-free 866-260-4517.